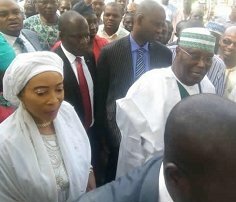 Presidential candidate of the Peoples Democratic Party (PDP), Atiku Abubakar, has expressed his firm belief in the democratic process of the country after casting his vote at his Ajia Ward 012, at10:04a.m, yesterday. Speaking shortly after voting, Atiku said he was very much satisfied with the entire process, noting that it was smooth and uninterrupted. The Secretary to the Government of the Federation (SGF), Boss Mustapha, also voted in his Gwadabawa Ward 009 in Yola at10:20a.m. Mustapha also said he was satisfied with the process of voting, but noted that there was room for improvement. He said all hands had been on deck to ensure smooth voting across the country. The SGF called on politicians to accept the results of the elections, saying the winners should be magnanimous in victory while those who lose should accept defeat in good faith. Sunday Sun observed that voting was going on smoothly in most parts of the state even as personnel of Nigerian Army engaged in a confidence building patrol in Yola and other parts of Adamawa to reassure residents of adequate security.